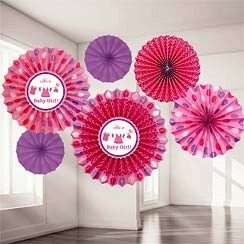 Create a baby pink party atmosphere with these hanging paper fans! Our paper fan decorations come in three sizes and feature prints or cutouts that match the rest of our "Baby Girl Clothes Line" baby shower theme. The pink and purple dots, chevron stripes, and baby clothes are too cute! Assembly required. Create a baby pink party atmosphere with these hanging paper fans! Our paper fan decorations come in three sizes and feature prints or cutouts that match the rest of our "Baby Girl Clothes Line" baby shower theme. The pink and purple dots, chevron stripes, and baby clothes are too cute! Assembly required. Paper Fan Decorations include: 2 Large fans, 40cm (16'') diameter each 2 Medium fans, 30cm (12'') diameter each 2 Small fans, 20cm (8'') diameter each String.